Depicts the West Feliciana Railroad - the oldest standard-gauge line in the U.S. when it was abandoned in 1978. 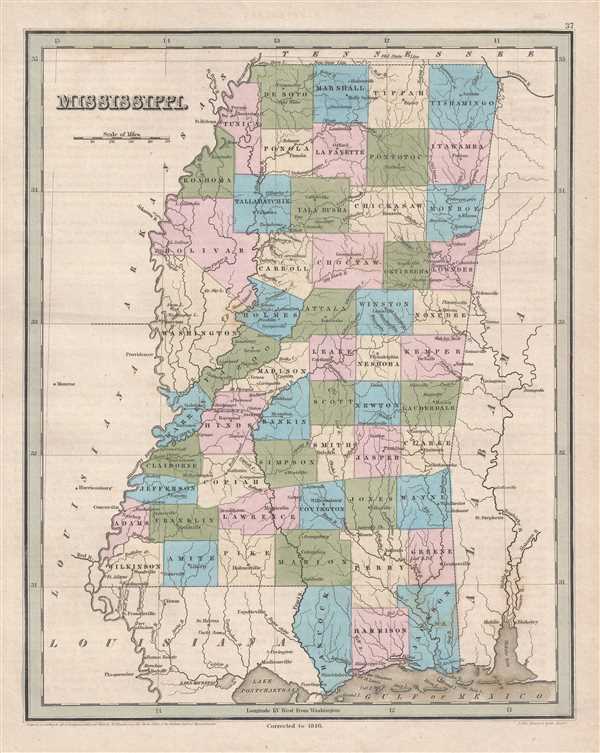 This is an 1846 Thomas G. Bradford map of Mississippi. The map depicts the region from Louisiana and Arkansas to Alabama and from Tennessee to Louisiana and the Gulf of Mexico. As is the case with the majority of the maps included in A Universal Illustrated Atlas, the nascent railroad network in Mississippi is illustrated. Four railroads are depicted: the Natchez, Jackson, and Canton Railroad, the Vicksburg and Jackson Railroad, the Jackson and Brandon Railroad and the St. Francisville and Woodville Railroad. Several of these railroads were rather short, only covering distances of twenty or thirty miles. Although exact histories of these railroads are not easily found, we know that that line between Vicksburg and Jackson was originally chartered as the Clinton and Vicksburg Company in December 1831 and reached Jackson in 1840. The West Feliciana Railroad, between St. Francisville, Louisiana and Woodville, Mississippi, is also illustrated here. When it was abandoned in 1978, the line between Bayou Sara and Woodville was the oldest standard-gauge line in the nation. It appears that all the rail lines completed in Mississippi were intended to transport cotton from plantations to the Mississippi River and that all the railroads were built almost exclusively by slave labor. Some of the corporations that owned and constructed the railroads even owned slaves. Highly detailed, each county is illustrated, labeled, and shaded a different color to allow for easy differentiation. Numerous towns and villages are labeled, including Jackson, Vicksburg, Oxford, and Biloxi. The mighty Mississippi River winds its way down the map, forming Mississippi's eastern border, along with myriad other rivers and creeks, such as the Pearl River and the Yazoo River. A handful of major cities outside Mississippi are also labeled, including Mobile and Baton Rouge. This map was engraved by Samuel Styles, Sherman, and Smith of New York and published in the 1846 edition of Bradford and Goodrich's A Universal Illustrated Atlas.